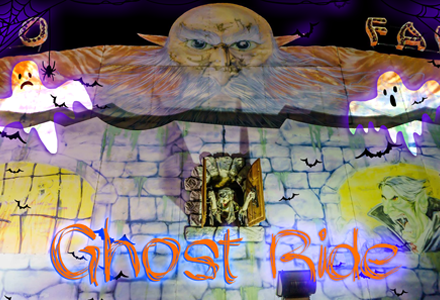 One-of-a-kind rides for all ages, that promise to take your breath away! 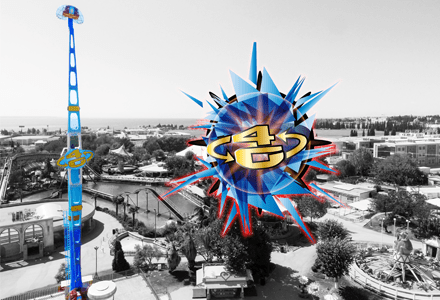 Take a deep breath, relax, and brace yourself for flying at four times the acceleration of gravity, reaching 40 meters above the ground! If you find out that 4G is your thing, you might want to look into becoming an actual astronaut! Are you cut out for a great adventure? Do you enjoy speed? 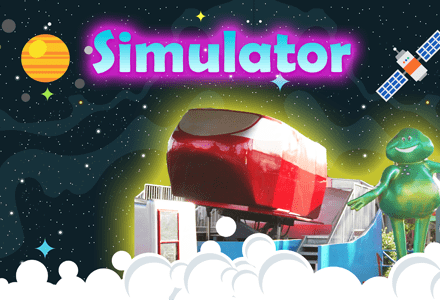 Get on our rollercoaster, hang on tight, and trek down 14-meter-long downslopes! 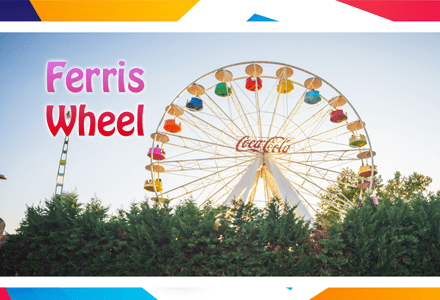 Don’t blink – allow yourself tofeel the centrifugal power at each twist and turn! It will be over before you know it! 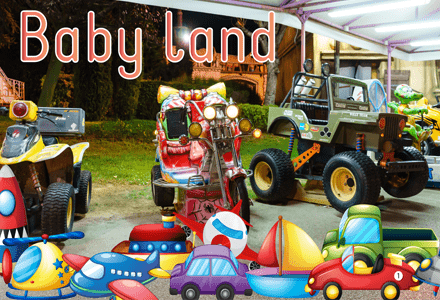 Our little friends can now experience racing atop these kid-sized bikes! 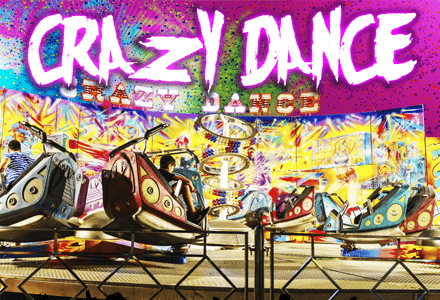 Feel like dancing…like crazy? If you’re proud of your dance moves, it’s time you put them to the test! We’ll spin you right round, again, and again! If you make it through this ride, then there’s nothing that you can’t really do! Time to swing – a bit different than usual! 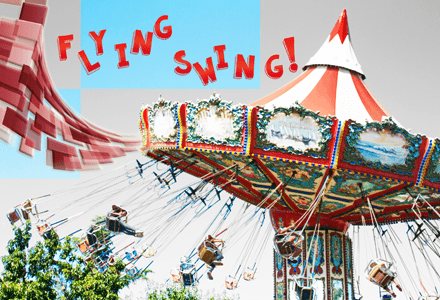 Get on Flying Swing, and really feel like you’re flying! 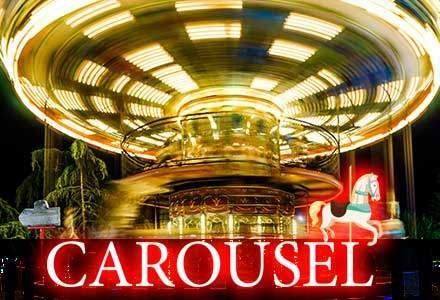 Swerve artfully as you move further up the ground, and move round and round again! Don’t close your eyes – enjoy your flying experience to the fullest! Gather your friends and slide down the largest slide in Greece – 35 meters long, 6 lanes wide! 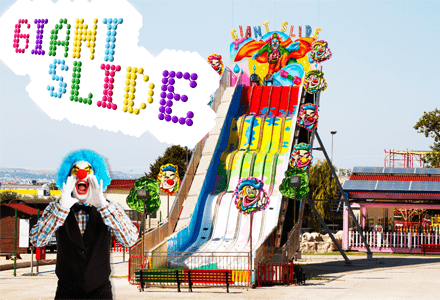 That’s really what they call a giant slide! Have you always wanted to go rafting? Well, here’s your chance! 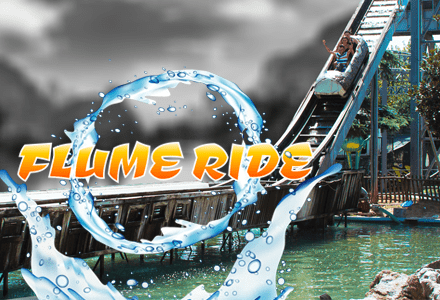 Sit inside Flume Ride’s tree log and go on a fast trip down two waterfalls, and land straight into a pool! Are you ready? 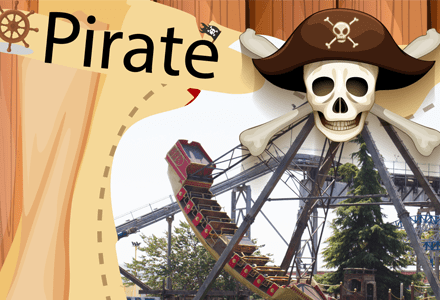 Want to feel like a true pirate?Discover just how high up in the air our rocking pirate ship’s bow and stern can reach, but, worry not, you’re safe: there are no sharks in sight! Enjoy a panoramic view of Thessaloniki, 25 meters above the ground! Feel light as a feather, and rotate your car, to enjoy breathtaking views of the city and its outskirts. A classic, and much beloved ride. Can you handle…shaking? 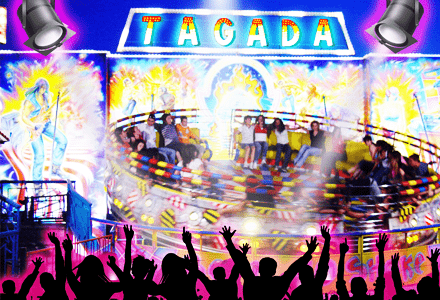 Ride Tagada and spin, in all directions, to the beat of the most popular, mainstream songs! 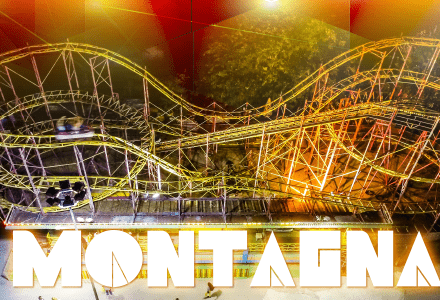 Tagada: the ride you can’t get enough of! 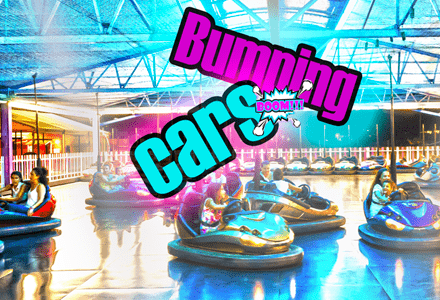 Hit the floor with your very own bumping car, put the pedal to the medal, reverse, swerve, and – be careful! Bump, before you get bumped! 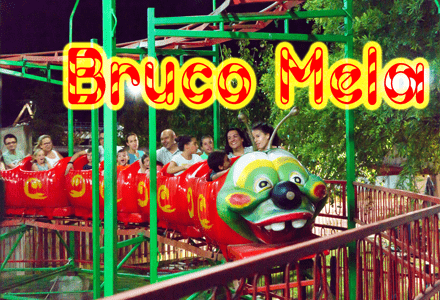 Well, even if you do get bumped, it’s okay – anything goes in this crazy ride! 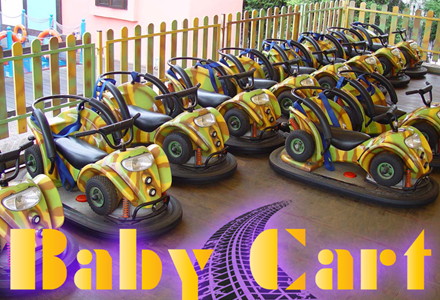 Will you be the best driver on the floor? Choose one of the 16 available simulation programs and enjoy an unforgettable experience! 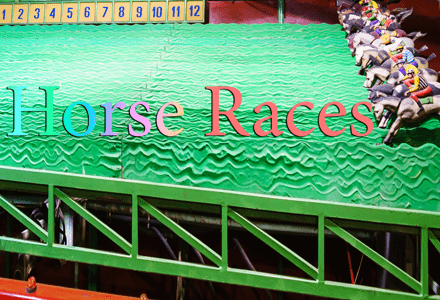 There truly is no way to describe it – you just have to experience it! Find your way through a glass labyrinth – but, beware! You don’t want your friends seeing you bump into the glass walls, do you? Traverse the balcony, walk through the dark hallway, and watch out for any surprises, as well as…the delightful breeze! Can elephants fly? Sure they can! 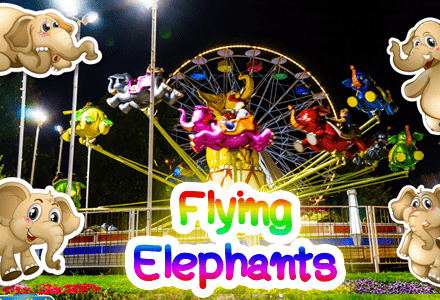 We’re not crazy – we really do have flying elephants in this park! Who said there can only be bumping cars? 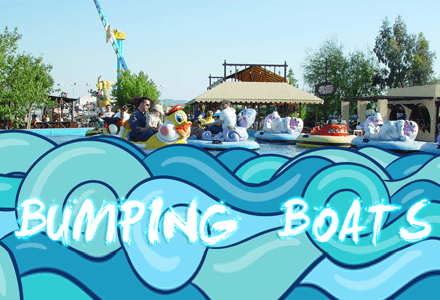 Have fun in the water, with bumping boats! Pick your own boat and try to bump into as many other boats as you can! There’s nothing to be afraid of – at worst, you’ll be enjoying some splish-splash action! 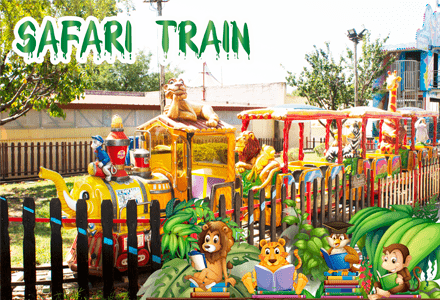 Our little friends revel in a unique safari experience, joining several jungle animals in their mighty parade! Too young to ride Flume Ride? No problem! Enjoy its mini version, and, before you know it, you’ll be ready for the real thing, too! Can’t ride the big train? No big deal! Just let this mighty caterpillar take you on an awesome ride! If you can’t dunk – at least, you can shoot! 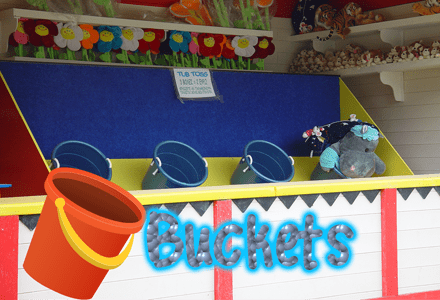 Throw as many balls as you can inside our buckets and claim awesome prizes! 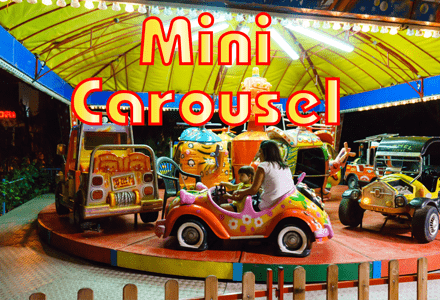 We have a mini version of our beloved Carousel, for our mini-sized friends, who are too young to get on the adult-sized ride! Fire! Quick, grab the hose, and help your fellow firemen put out the blaze! Show them who’s the boss! 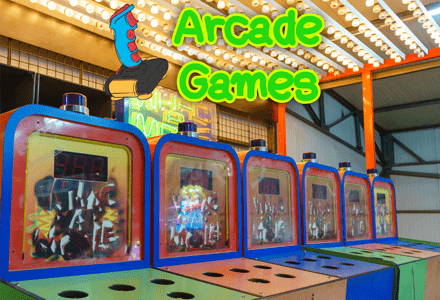 Score the most points in air hockey, throw in as many hoops as you can while on a time limit, and win the most points on our collection of classic arcade games! How many rings can you stack on each bottleneck? We thought it’d be easy, but, alas, it’s not! 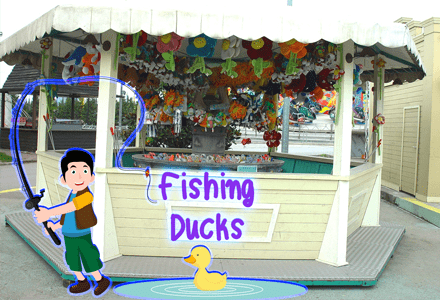 Go fishing for these bobbing ducks and tally your score to win great prizes! Quack! 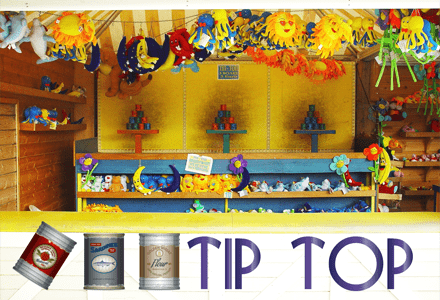 Focus, point, and shoot your ball, and try to take down as many cans as you can! It’s not as easy as you might think – there’s plenty of them in each stack! 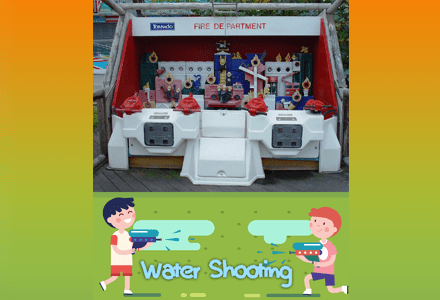 For those loving classic amusement park games, and those that take pride in their shooting accuracy, shooting makes for the ultimate skill-testing game! Pick up your gun of choice, point, take a deep breath, and fire away! 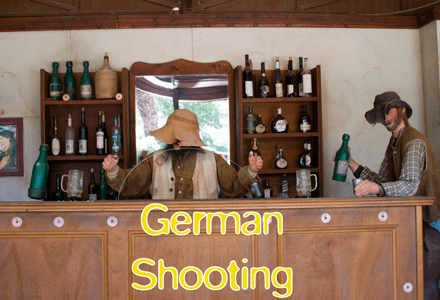 Just be careful not to shoot us! Welcome to the Wild West! 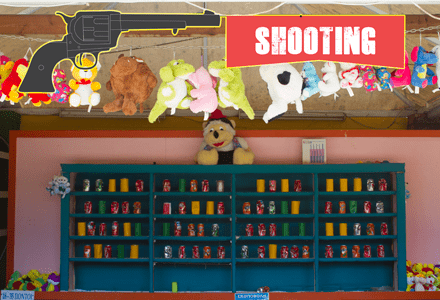 Shoot at the electronic targets located all across this cowboy-themed range, and see how saloon patrons will react to your spree! You’ll be surprised! 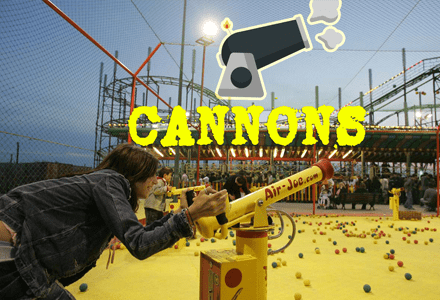 Grab your cannon, load it with as much ammo possible, and start shooting in all directions! We’ll be taking cover! Giddy up! Race against your friends, and try to be the one to reach the finish line first, to win awesome prizes, in what will definitely an awesome match! 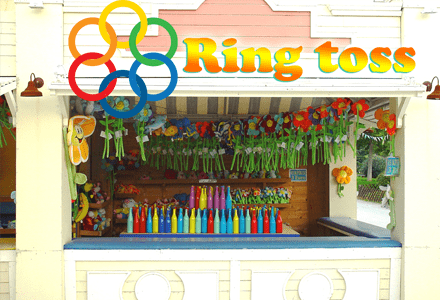 Ring around the rosie, in one of the park’s most popular attractions! Because the world belongs to babies!